“Nipper,” the RCA Victor advertising dog, was one of the most familiar advertising icons of the early 20th century. The image was used extensively on products by RCA, the figures used in stores and outlets that sold the RCA product line or serviced them. But for the decision of one man more than 100 years ago, the image of Nipper would have belonged to another company altogether. 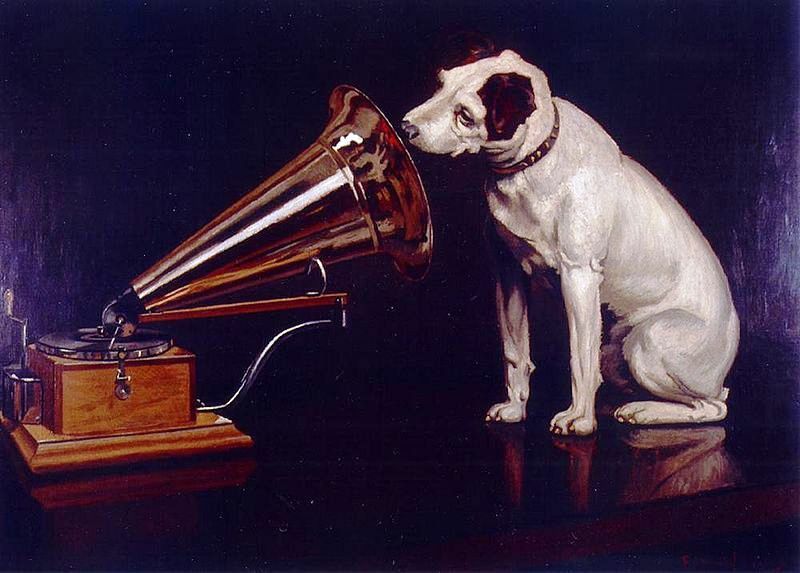 “Dog Looking at and Listening to a Phonograph,” painted by Francis Barraud, would become one of the best know advertising images in the world. 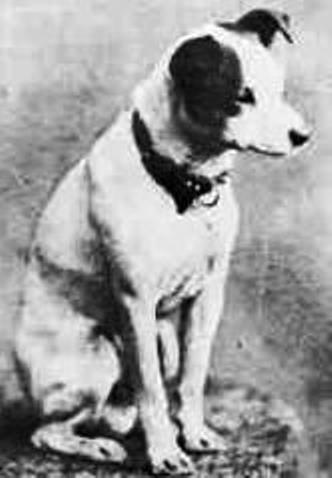 Of Nipper himself, history claims the dog was born in Bristol, England in 1884, gaining his name for his habit of nipping the backs of visitors’ legs. He became an orphan in 1887 when his first master, Mark Barraud, died destitute in Bristol in 1887. Nipper was taken in by Mark’s younger brother Francis, a painter. Barraud noticed his new dog was perplexed by the sound of his phonograph, wondering where the sound was coming from, but it wasn’t until three years after Nipper’s own death in 1895 did Barraud produce this image he called “Dog Looking at and Listening to a Phonograph” on canvas in 1898. The only know photograph of the original Nipper, in that famous pose. 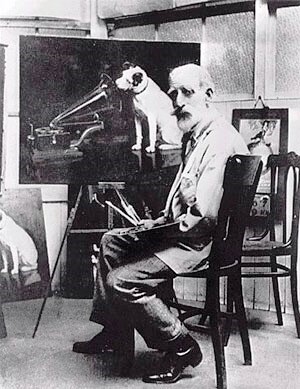 Like many artists, Barraud needed to make a living and took his painting to Edison-Bell—as it was one of their machines shown in the painting—and offered to sell it to them, only to be told “Dogs don’t listen to phonographs.” Not put out by this rejection, Barraud went to the newly formed Berliner Gramophone Company Ltd. The manager, a Mr. Barry Owen, asked if the painting was for sale and could it be altered to show one of their machines? Barraud suggested it could, was given one of their machines, and simply painted over the Edison machine. For his labors he is reported to have received £100 (at the time about $485 US) for the painting, and an additional £50 ($240 US) for the copyright on September 15, 1899. 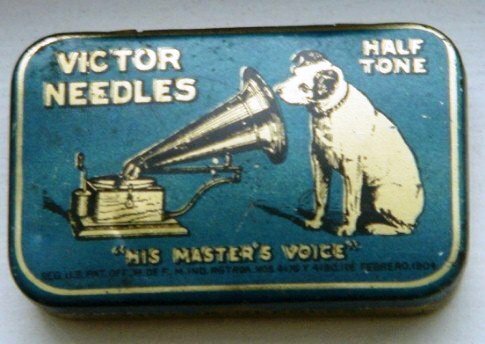 Nipper shows up on this needle tin from the Victor Talking Machine Company, 1904, for Victor Half Tone needles. In a visit to the London office in 1900, Emile Berliner saw the painting hanging on the wall in Owen’s office and liked it enough that commissioned Barraud to make a copy of the painting, and he registered a trademark for it as soon as he got back to the USA. The trade mark was granted by the Patent Office on July 10, 1900. Barraud went on to produce 24 copies of his original for the Gramophone and Victor Companies by the time of his death in 1924.